As many of you will know there has been a long running saga to gain permission to erect a plaque at, or very near, the site of the first radio station at Seaforth Sands, designated LV. This was the forerunner of GLV. 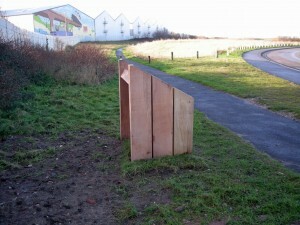 The plaque was designed and now at long last it has been installed in position. The father of the project is Ken Jones who has worked long and hard over several years to get to this stage and he is to be congratulated for his tenacity in getting the project to fruition. The text of the plaque is shown below and photos of the era have been merged into the design. 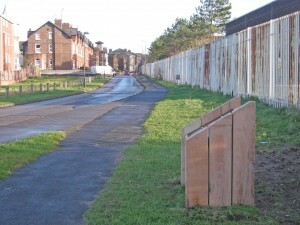 Photographs of the plaque in situ are shown below. After an element of to-ing and fro-ing over the position where the council would allow us site the plaque, when the time came to erect the plaque the installation gang had to move away a few few feet from the chosen position and it now looks as if we have actually landed right on top of the foundations of the original building. It is the intention that there will be a formal opening of the plaque during the 2015 annual reunion on Saturday 18th April. 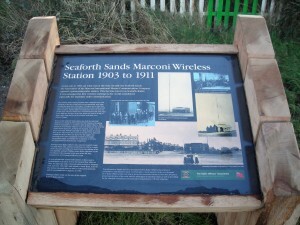 On this site in 1903, on what was at the time literally the Seaforth sands, the Marconi International Marine Communication Company opened a pioneering radio station. This became known as Seaforth Radio. It was amongst the first wireless stations in the world established especially for maritime radio communication. The Seaforth Sands station provided radio communication with shipping in this part of the Irish Sea, but specifically with ships entering the great port of Liverpool. Liverpool was, at that time, one of the busiest and most important ports in the world, second only to London. Marine radio communication was very new, but for the next 100 years was to be a vital information link with ships at sea. Otherwise, for most of the time before the advent of ship to shore radio, ships had been out of touch with land, even when in danger. However, the Seaforth Sands station had particularly the distinction also of being the first school for the training of sea-going wireless telegraphists, to be known later as radio officers. Many hundreds of such radio officers were to be trained at the Seaforth Sands station during its period at this location. Some of them were to become famous especially for their exploits in saving life at sea. The station served also as the first of an ultimately worldwide chain of Marconi depots for the supply and servicing of the radio equipment installed increasingly on merchant ships. Eventually, the installation of wireless, as it was known as then, became compulsory. Amongst those radio officers who trained at Seaforth Sands was Jack Binns, who achieved world fame in 1909 as a result of his vital part in saving very many lives in the sinking of the rms Republic, and Jack Phillips, senior radio operator on the rms Titanic, who remained at his post when the ship foundered in 1912, losing his life as a result. As with all maritime coast radio stations in this country, Seaforth Radio was taken over by the General Post Office in 1909. Its important radio communication services to shipping were moved in 1911 half a mile inland to Sandy Road, Seaforth. The station remained there, its mast a well known landmark, until it was transferred to Anglesey in 1960. 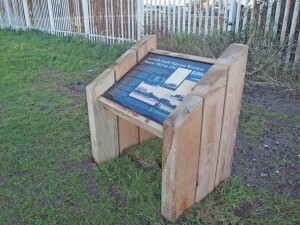 This information display has been promoted by the Radio Officers Association in cooperation with Sefton Council. It serves also to be in memory of the two thousand or so radio officers who were lost at sea in the twentieth century, in both war and peace, protecting the lives of the crew and the passengers of merchant ships, as well as providing for the essential commercial communication requirements of British shipping. Nothing remains today on this site of the original Seaforth Radio station.